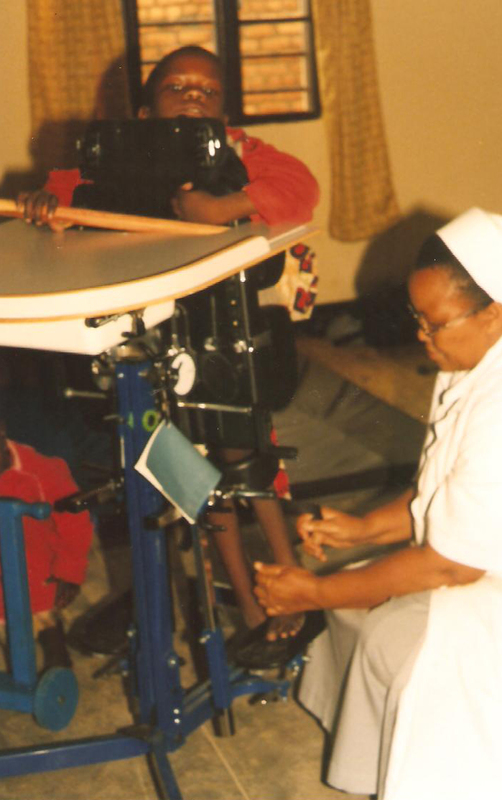 With the aim to contribute to the reduction of poverty in the region of Kitabi, the Congregation of the sisters of Saint-Francis Kitabi has opened a centre for young people with disabilities. Rwanda is one of the poorest countries of the world. It includes a population of +/- eight million inhabitants, the youth represents 63%. 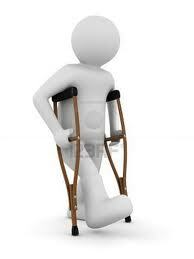 According to the population census in 2002, the country has 308501 persons with disabilities or i.e. 3,9% of the population. The same source mentions 14 816 people with mental disabilities. Children with a mental disabilities are victims of deep-rooted prejudices in the Rwandan society. They are seen as the result of a curse on the family, sometimes as the will of God in the redemption of debt. In any case, the birth of a disabled child is experienced by the family as a punishment and therefore, as something that for the outside world must be hidden. It has lasted until the beginning of the 1990s before parents –mainly mothers-started to revolt against these practices. They grouped themselves and started to come up for the rights of children, victim of a mental handicap, to live and to be happy as “child just like all children”. Early 2000 several organisation, more specific the shelters started. Target was to give children with a mental handicap a place, mainly during day time, and to offer them socio-educative activities (specialised food, physiotherapy, education to a profession,…) but also to offer a shelter to children with more severe handicaps, which demands a more extended support. The Congregation of the sisters of St Francis of Assisi were, well before all the other associations, concerned about the fate of children with a mental and/or physical handicap. The project is to support children and young people with disabilities (large agglomeration of Kitabi) by the establishment of the Centre (physiotherapy, consulting rooms, multi-purpose hall, dormitory, refectory, kitchen, electricity and supply of rainwater). Pleased to meet you again through this letter. The sisters of Kitabi embrace you friendly. We express our gratitude for everything you do for us and for the people of Rwanda but especially for the disabled children of our center by supporting them with material. The center has opened its doors on April 14, 2012. We have 5 children hospitalized and 32 ambulatory children. The new cases have been made by a physiotherapist of the hospital of Kigeme on 25 km who came every Sunday. The others are taken care off in the hospital of Gahini. 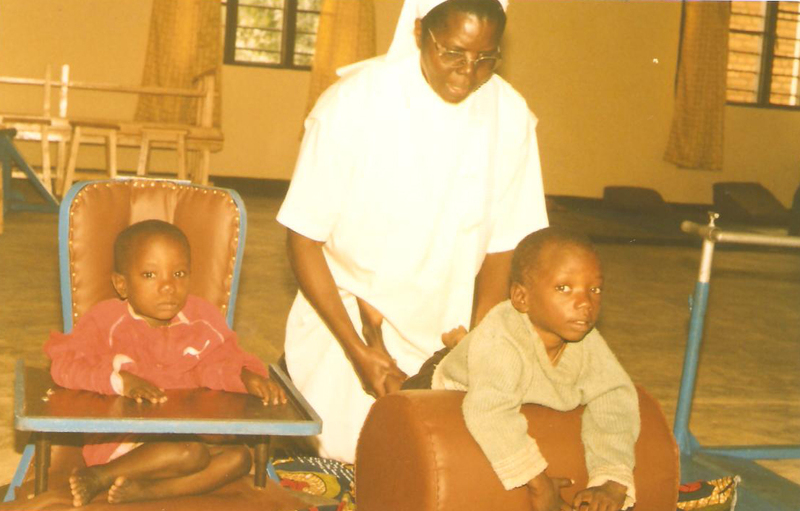 Two blind children are in a school for the blind in Kihebo and two are in the school for deaf children in Butare. Thank you once again for everything, God bless you. The peace of Christ they with you. It is with great joy that Iwrite you this letter with my very best wishes. How are you and your family? Let us hope that things are going well with everyone. With this letter I would like to sincerely thank you for everything you do for the poorest of the world and in particular for Kitabi. What can I say? Words are too short to express my sincere thanks. That the lord may bless you hundredfold. Thank you a thousand times. The installation of the electricity is finished, as well as the sewing room and the woodworking hall. Since 3 months the pupils use the electrical machinery, the irons and as well as the manual machines. They are very satisfied. It is fun to see that the pupils are very dedicated and satisfied. They have already made many pieces. he parents are very happy and they are very grateful for you. There is also the installation of the small woodworking place so that these pupils can continue to work despite much fog. A thousand times thank you for your generosity. Enclosed please find a number of photographs of the two centers: the installation of electricity, the material, the water tanks etc. Once again thank you very much, we look forward to you this year to look back. May God bless you. We embrace you!